Well well well, first glance and what a nice artcover indeed, who said J.-P. Fournier ? I think I did :), damn you're good man, makes me want to forget about making artcovers alltogether, but well, it's not like I would have time to do many of those anyhow. 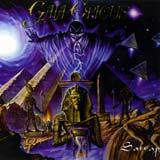 So, art tastes aside, Gaia Epicus is a ... Power Metal band yes (how did you guess :) ? ), and they play in the veins of the masters and inventors of that category, who said ... Helloween ? (yes precisely). Let's get one thing straight : these guys are not original, they don't have the best of production (though the album was mastered at Finnvox by Mika Jussila), and they surely have some funny song titles, but you know what ? They are cool, and it is very fun to listen to them play Power Metal with such devotion and metal filled energy. So hats off, especially to the mastermind of the band M. Thomas Christian Hansen. Who beside writing all songs and lyrics also plays the guitar (masterfully I might add) and sings altogether. Well, I can do all this as well you know, uh-hu well... kinda , in my dreams that is :D. Ok ok let's try to be serious for a minute. So back to Gaia Epicus. What do they sound like ? They sound like a very epic and movie inspired quintuet of power metallers, that's what they sound like. The strongpoints of this band : without any questions : the guitars ! Simply put : they kill ! Fast riffs unraveling the earth, ultra fast solos to keep your mind crazy. The band also have a very high epic factor, you can't control yourself and you automatically start headbanging and singing along. Now on the funny side : the song titles :) : Heaven's Gate, Freedom Calls (huh, guys, those are band names, hehe) and the nice surprise : Star Wars ! Yes indeed, and don't think it's just a coincindence or anything, the imperial march-like melody at the of one of the many solos of this very epic song stands for proof it isn't, so does the Rebel's anthem at the very end of the song(perfectly executed I might add). To be honnest I really wanted for a metal band to cover some Star Wars ground, cause beside Heavenly's mention of a jedi in the middle of one song, the names of Lucas' galaxy's defenders has been quite omitted from metal songs (unless I have missed all of it, which I wouldn't be surprised too). Now, the downsides : Mr. Hansen (nope that one...Gaia's Epicus' Hansen) has not the best vocals there is... he's not bad either, but nothing thrilling. And like I said before, the production could be much more, and it would give this album a whole different dimension. Overall this is a very pleasant surprise. This album could so much better if both vocals and production were uplifted in level. But all in good time. If you like lightning fast yet melodic riffs and solos and overall epic songs (with some hymns) then this Satrap (whatever this means) is for you !